It’s almost hard to believe that there was a day when our overly protective, professional busybody class inside the Washington beltway didn’t obsess over every aspect of our daily transportation like a helicopter parent at our first prom. There were (kids, ask your parents) light, breezy times when drivers could wander onto a car lot and drive away with something that was actually interesting and fun, which you could tell at a glance who made it and when. 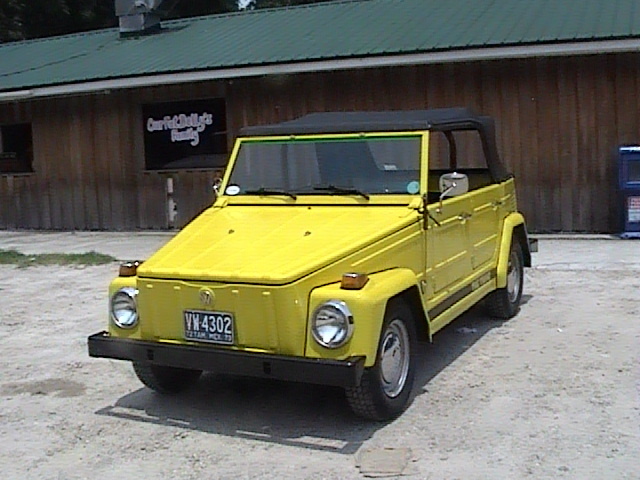 My recent trip down to the Suwannee River in Florida reminded me of this when I spotted this immaculate VW Thing patiently waiting for its (no doubt happy) owner outside the only restaurant in White Springs. This is the kind of rig that just couldn’t exist in the lo-carb, no lead, crash-survivability- index nanny state we live in today. If you read CC, you probably already know that the Thing was an update of the WWII Kubelwagen staff car that minor Sturmbannfuhrers and Oberststurmbannfuhrers tooled around in while terrorizing Europe in the early/mid 40’s. The donor car was the humble Beetle , which lent the floorpans, driveline and build quality to a superstructure designed to traverse the trackless roads of Russia while not boiling over on patrol in the heat of North Africa. Despite having less horsepower and only two-wheel drive, the Kubelwagen did remarkably well even in difficult terrain, served with some distinction. Fast forward 25 years. In the U.S, backwoods hunters and beach bums were chopping the front and rear overhangs off of their Beetles and making respectable off road machines with them. The lighter weight and good clearance of the Baja Buggies even supported a few west coast companies that did nothing but conversions. This did not go unnoticed at VW HQ. South of the border, Mexican drivers were ready to pay good dinero for a vehicle that could handle their country’s road conditions, which ranged from “primitive” to downright shocking. Mr. Opportunity was knocking loudly, and VW was determined to open that door, since an updated military version was already developed. The car debuted in Mexico and Europe in 1969 and came stateside in 1972. The Mexican version saw fair sales (it was popular at vacation spots like Acapulco and Cozumel), but never really set the world on fire. In Mexico , it was sold as the Safari. 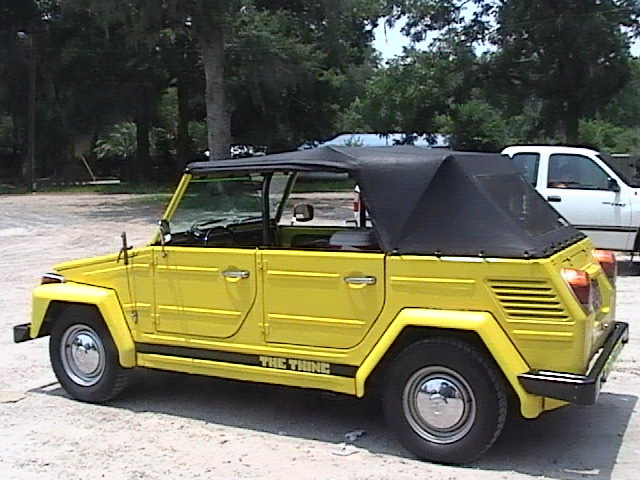 In the U.S. VW began a long tradition of embarrassingly bad monikers by naming it…The Thing. It seems that the marketing people just threw up their hands (late on a Friday) and admitted that they couldn’t think of a proper name, so “The Thing” was it. The U.S. Spec models came equipped with the 1.6 flat four that had made the Beetle and Karmann Ghia renowned for their durability and economy. The K-G floorpan was used in this iteration, being wider and stiffer than the Beetle’s. A four speed manual (again, borrowed from the VW parts bin) actuated via a long clutch cable got The Thing moving, if not with speed, but a certain elan that delighted its happy owners. 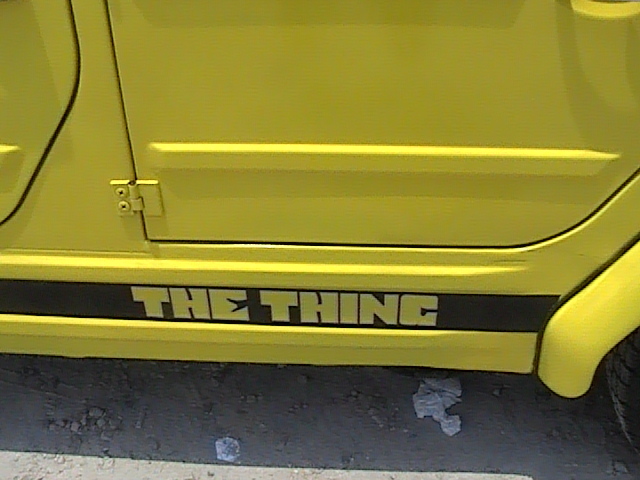 There’s no question, in its day, there was no thing on the road like The Thing . There was no “me too” product to compare it to, so you weren’t going to see your car at every intersection. Tops came down, doors came off and the windshield folded onto the hood for wind in your face (and bugs in your teeth) fun. The mechanicals were simple and there was plenty of room to haul the dog(s), kids and lots of outdoor toys. You could even turn a garden hose on the insides to clean off all of the fun when you were done. What was not to like? Well, lots of things actually. Lots of Thing strengths turned out to be weaknesses when subjected to the harsh light of everyday American drivers. The Spartan interior was hot in the summer(lots of painted metal) and cold in the winter (lots of cold painted metal), the heating system was like other Vee Dubs, inadequate, and the lack of accessorization meant that like most toys, once you took it out of the package and played with it, you got bored. A propensity to rust and a balky clutch cable prone to breaking made a lot of Thing owners ex -VW owners. But the thing that really killed The Thing was shifting federal policy that more or less regulated the car out of existence. Coming federal crash and safety regulations (that The Thing could not meet in a million years) meant that its stay on our shores was brief. After the 1974 model year,VW dropped it and concentrated its time and attention on replacing the donor cars in the hearts and minds of America. The sun was setting on the old school, air cooled flat fours that VW had built for decades. In their place, leaky, overheating, wheezy water cooled fours would wreck the reputation that were built with cars like The Thing. A day has not passed that I have not wanted a Thing. But everyday I come to my senses, mostly. As someone who’s used an open Jeep, and a mail truck, as a daily driver…I could see it. The added fuel economy would be welcome. The ragtop and side curtains would not be intolerable. And the styling…oh, man, the styling. I really don’t see it as impractical. Fiberglass hardtops were made for it; our local Vee-Dub dealer had a few on the lot with them. And I can see an aftermarket manufacturer making either side-curtains with sliding glass, or whole doors with roll-up windows. It was…the right vehicle but at the wrong time. Were the laws, or their implemenation, a little different, this could have been the Thing to keep the Bug alive…in some form. Your mention of fiberglass tops for the thing certainly got my attention. Do you know of or how to reach some one who may have one of these? My car has a full rollcage with an aluminum top. It needs to be better. My buddy and I wanted to pick one up just for the WTF factor.. But this was back when JCWhitney still sold “full race” cams for the SBC(ugh) and every part of a “Beetle”, Jeep, and Mustang other than the roof in the catalog and their HQ was on State. My old landlady had the beach version of the Thing and had even fewer features than today’s CC. This included a rather garish fringed canvas top that looked like it belonged on a patio umbrella. I don’t recall there being a roll-bar or even windows, aside from the windshield of course. The floorboards had rusted out so they were replaced with plywood – or warped plywood, since we lived near the coast. Amazingly, the car lasted an unbelievably long time despite a total lack of maintenance. Sure, there was the ubiquitous rust that marred the two-tone paint job (blue and white), and the engine leaked oil like crazy, but it ran nonetheless. The Thing that should not be actually served its purpose rather well. As far as being “regulated out of existence,” I seem to recall that there was some confusion as to whether the Thing ought to be classified as a truck or a car. Truck safety standards were of course more lax (and didn’t require shoulder belts, etc. ), while car safety standards it wouldn’t have even met in 1969. As a four-place vehicle with 2WD…it couldn’t qualify anywhere but as a car. The confusion was probably caused by VWoA fighting to get it reclassified. Obviously that failed or they relented…probably Wolfsburg told them to give it up. The marketing plan was shifting; air-cooled Beetle-based vehicles were on the way out in favor of Dasher- and Golf-based models. I for one welcome crash and no-lead regulations and don’t feel deprived. Remember back in the ’70s here in LA when buildings a 1/2 mile away would fade from view and the sky was blue only when you looked straight up? This sounds like… Oh, just about any city in China. Does anyone have sales figures for these? Even with what you would think would be very limited appeal, I recall that they were not uncommon in their day. I think the Jeepster Commando roadster was pretty similar in concept – it was discontinued about the same time that these were introduced in the US and Canada. I saw one of these at a traffic light on the way home this past week. A pastel yellow (as opposed to the safety yellow on this one) and it appeared restored. Top was down and the female driver seemed to be enjoying the ride. It was going the opposite direction and I didn’t have time to turn around and chase it. Thank you for this piece so that I can stop obsessing over the one I missed. I too wanted one of these, and first saw one at my local Auto Show probably 1974. It was the most spartan new car I had ever seen. But you are right, these never developed much of a following. One question that has always bothered me: I remember that when these came out, they used the older-style bowl hubcaps that VW had stopped using on cars after maybe 1966. I never understood why they used the old ones on just this vehicle. The subject car has the flatter versions, did VW change hubcaps on later Things, or did the owner swap for the more modern caps? In 1967, wheel hubs and wheel design were drastically changed…and with it, the bowl hubcaps went away. That was with Wolfsburg-built Beetles, which is what America got. VW had plants all across the world; and designs were not upgraded as one, but according to local tastes and needs. It may be that the Mexican plant, which is where these Things came from, was still using the old wide-pattern no-center wheels. Or it may be they used hubs and wheels different from either the new or old styles. From memory, those don’t look like the old-style salad-bowl hubcaps; those appear to be either aftermarket or something singular to Mexican manufacture. This was a parts bin special. Karmann Ghia pan was mentioned, but the brakes, hubs and rims were a mixture of late 1960’s bug and bus, that is why the 14 inch rims with the wide 5-bolt pattern. 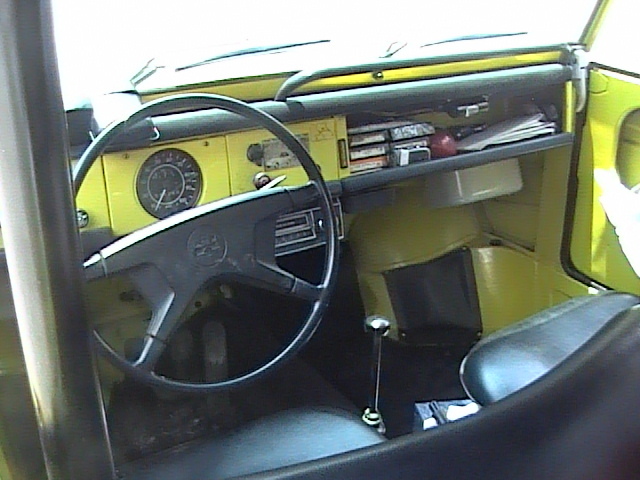 The Mexican version had an old bus transaxle, with outer reduction gears, but the later version imported to the US had a modified bug/KG transaxle with HD CV joints and a different final drive ratio. The hubcaps shown are not correct. They look like 66-67 bug and should be the older style ones you mentioned. Safari was a GM trademark for Pontiac station wagons, so VWofNA had to come up with a different name for our market. I wonder if the reason for calling it The Thing in the US, rather than something more appropriate and suitable like what it was called in Mexico (Safari), was that VW was being overly cautious and sensitive to conjuring up visions of resurrecting a former WW2 troop carrier (from the wrong side) to sell to prospective US customers. Pontiac had the trademark on “Safari” at the time for their station wagons. The true purpose of those laws, is, not safety but control. Politicians are, by definition, egoists and control freaks. Once they’ve broken the bounds that kept government from meddling in consumer products, all bets are off. There IS still a loophole: Three-wheel vehicles qualify as “motorcycles” and are not subject to these safety standards. The Wildfire and other off-brand brands are Chinese vehicles with phenomenal fuel economy…and safety is whatever you make of it. I for one remember well that on most summer days in the 1970s, from downtown Vancouver you could not see the North Shore mountains, which are like 8 km away. Now it is almost always crystal clear. Whenever on the rare occasion a 60s car passes me belching fumes I can see the reason. I do NOT want to go back to that. 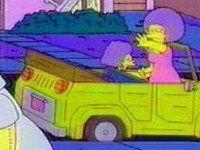 Here in Soviet Canuckistan, the road death rate has been cut in half since 1980. This is because of more strict drunk driving laws but also, cars are better than they used to be. I like driving a safe, well built, powerful car that handles well. Much of the reason we have such cars now is legislation. I do not want to go back to 1960s death traps. Late last year, this province introduced the stiffest drunk driving penalties in North America. The deaths from drunk driving crashes has been cut in half since then. I do not want to go back to people getting hammered and driving their cars. Change is inevitable and I try to embrace it instead on resisting. This has served me well. My business didn’t exist fifteen years ago and it is a result of accepting change. And what is more, I am even married to a Card Carrying Commie! Whodathunkit? My Japanese friends think kei cars are death traps and won’t drive them. The major difference between here and Japan is in Japan, speeds are very low due to traffic congestion. A collision with a kei is therefore unlikely to be fatal, although many are. The speeds here would make any collision a fatality. Note that in Japan, kei cars are not allowed on expressways. I doubt that a kei would sell here. Heck look at the sales of the Smart. Guys I’ve got a little more than 10 mile round trip commute. I ride a scooter as many days as possible on that commute, you can’t tell me I’d be in greater danger on that commute in a kei car than on two wheels. FYI the speed on that commute does not exceed 50mph. I just want choice. BTW most non performance models of the late 70s and early 80s can’t keep up with freeway speeds now. Imagine trying to go 80mph across the mountain states in an unmodified 1983 Oldsmobile 98 with the 307V8. My Cutlass could hardly do it, I know the heavier 98 would be likely to have to slow down to “unsafe” speeds going up interstate grades. And that sums it up. Life is all about choices – cars, and jobs, and places I’ve lived…at times had a margin of safety that others would eschew. But like anyone else, I weighed pros and cons…and chose WHAT WAS BEST FOR ME. I, too, use two wheels as my summer primary mode of transportation. Unsafe? Some say. My insurance company says – and underscores it with wallet-crushing rates. But I like the economy as well as the experience. Likewise a kei car…or many American cars in the past. The Corvair was labeled “unsafe” – yet statistically it was almost as safe as any other car its size. Or the Pinto…one horrible accident does not an unsafe design make. Oh, there were flaws; just as there were and are flaws on all kinds of products that appear. Every design has them…the only way to remove that risk, of an as-yet-encountered accident, is to order everyone into armoured personnel carriers. I’m not arguing in favor of dirty air or irresponsible designs. What I’m saying is that the primary choice should be with THE CONSUMER. Let him decide, if the risks outweigh – just as he should decide, wrongly or not, whether an electric or hybrid car is better for him and does what he wants, in performance and environmental impact. Others here mentioned the dirty air of old. Well, we’ve gotten WAY past that…some years ago, a politician asked: “How much clean air do we NEED? That question, crass and ignorant on the surface, in fact is an intelligent observation of the point of diminishing returns. Detroit and others completely, COMPLETELY re-engineered automobiles to meet these emissions standards. They were successful, but at a price – a tripling of new-car prices and a hit to their bottom line to where in the current recession, two of them didn’t make it without bankruptcy. Which will have us all driving…what? Old cars, probably. There’s no engineering knowledge to get us to low-emissions, 60-mpg cars that can pass a 50-mph barrier-crash test. Are consumers clamouring for these standards? They are not. The pressure is coming from the Control-Freak class mesmerized with the magic power of their own directives. Adjusted for inflation, cars are no more expensive than they were 40 years ago and the are much safer, handle better and more reliable. If you want to drive a death trap, go buy one. There are plenty of used ones around. I somehow think not many consumers are are going to buy a new car with only the minimum safety equipment and a poor crash rating. You may want to go to your nearest Bombardier dealer and have a chat. 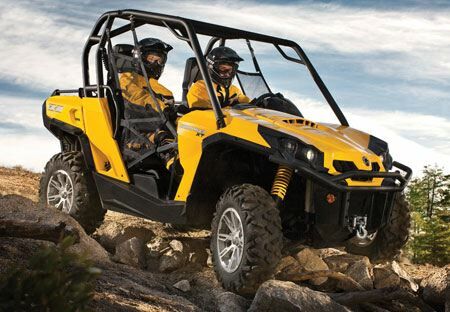 There is a guy who lives near me who drives a BRP Can-Am Commander (I thought it was a Kawasaki Mule) to pick up coffee and donuts. I haven’t had a chance to talk to the guy, but it is fully plated, registered and inspected. There is no way this rig is any safer than a kei car. LOL (n that’s why we should all read TTAC and CC.) Those are definately a option. Saw a few on my summer travels this year and they caught my ladies attention, although my next motorcycle will likely be a true motorcycle and come “gently used.” I view them as toys too and wouldn’t want to drop huge amounts of coin on them. For me, the REAL problem with the Thing was that it was a watered-down version of the real Kubelwagen… kinda like the current Jeep is a watered-down version of the real, World War Two Jeep… if VW had recreated the Kubelwagen– with the original, cool, military body style (and using the 4WD out of the syncro-driven Bus) they could have had a winner in the niche market (which was later filled by the Suzuki Samurai). The Jeep was a designed from the ground up military vehicle. American Bantam and later Willys (and Ford) built a utility scout car for which civilian demand was unforseeable at its launch. It’s no stretch to say that the Jeep saved Willys after V-J day (the anniversary of which I hope we’ll all remember in a couple of weeks). Willys could probably have sold the Americar postwar due to huge demand for anything on wheels, but it correctly perceived the possibilities with the Jeep. Conversely , the 181 went in the opposite direction developmentally. 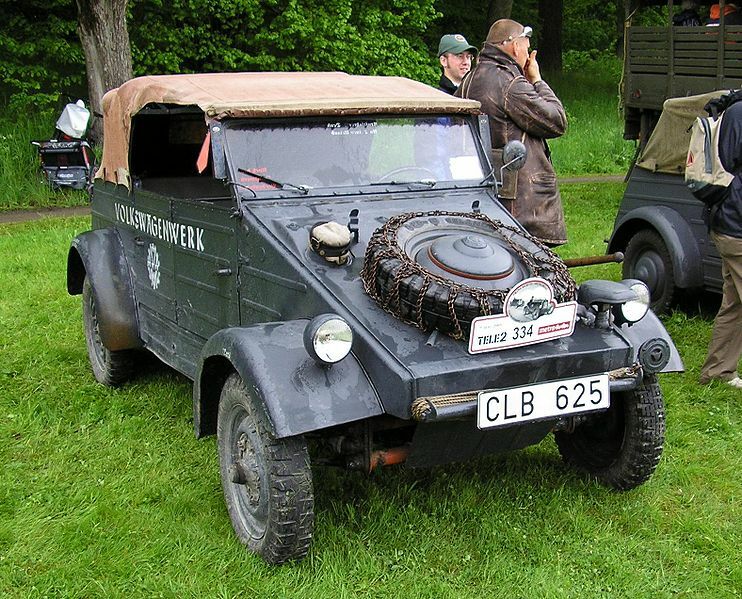 The Beetle chassis and engine was already in production and the K’Wagen was adapted from civilian to military use. Of necessity , this involved compromise. The result was okay , but it had its limitations. The Jeep was more powerful , more adaptable (Jeeps could pull trailers and had 4 wheel drive , which was a Godsend in the Pacific) , and could do armed scouting and reconaissance more effectively because of a higher top speed. Finally , there are lots of reports of Red Army officers that posted a 24 hour guard on their lend lease Willys. Captured Kubelwagens were generally disdained because of their relative complexity and weaker powerplant. I always wanted a Samurai, but found after careful measurement (and by checking local zoning laws) that I could not live in one as my primary residence, which is where I would have been if I had bought one in 1988 with a small child and another on the way. Mrs. Nelson would have seen to that. It was a ’74 Thing, with its obvious Nazi-jeep roots, that the state of Georgia a few years back in its infinite wisdom chose to grace with the license plate “HA8 JWS.” After the owner got tired of being accused of espousing, shall we say, a Nazi sentiment, Georgia banned the sequence “HA8” (which mostly affected “Hobby/Antique” plates, all of which start with HA). The last time I saw one of these, two really ugly women were in it. All right, Paul, I’ve had enough! Stop it! NOW! What are you trying to do? You’re making my life flash before my eyes, at least my life 30-40+ years ago! Thanks a lot! Where was I? Oh, yes – the THING! After I burnt out no. 3 piston on my buddy’s new VW Super Beetle (automatic stick shift, and I didn’t know you had to keep the revs up) and had it in the shop at the Yuba City VW dealer in August, 1973 – he was in Okinawa for 3 months and I was taking care of his car, as I had already sold my avatar and was only three days away from leaving the air force – I picked it up on Friday, Aug. 10th. As I was waiting, I strolled around the lot and was astonished to see these – these – THINGS sitting all over the place. Yellow, red, orange, green, all in a satin-finish paint job. I had never seen anything like these except in a WW2 movie! At first glance, I really wanted one, as they were different, but after examining the (lack of) features, I decided: Nope. I would have been better off in a CJ5 Jeep. While the Thing looked pretty cool, I was in no position to buy anything, as I was set to go home on the 13th and already had my plane ticket. So, after picking up the Bug, I drove around the lot a couple of times trying to imagine myself in one of these. I couldn’t. It was over 100 degrees, and I suffered driving that VW. I could only wonder how much worse a Thing would be! BTW, the VW was repaired free under warranty. Whew! Be that as it may, there’s a beautifully restored yellow Thing in my area and I see it once in a while. I just smile and look for the next restored “CC” lurking here abouts! Yeah, yeah, I know, I’m getting old! Keep the “CC”s coming! I can’t wait! Let’s be honest here: The above quote is out of step with the views of most Americans. Actually, WAY out of step. Has been for years. Why is it that most auto gearhead blogs seem to think that just because you enjoy cars that you will lap up whatever self-serving propaganda is spewed from the lobbying arm of the auto industry — and often the fossil fuel industry as well? Right. You don’t see a contradiction between someone who loves cars and the personal mobility and freedom they represent; and hating the auto industry; hating the oil industry (which makes NINE CENTS off every gallon of gas sold) and loving the all-powerful government that is working to destroy all of it. You want to see what a car in a totalitarian state looks like? Google Lada. Read up on the Yugo. Or, recall the wonderful products from British Leyland. You don’t like the petroleum industry? What are cars going to run on, solar panels? Sails? Or maybe we just need some controls to limit “excessive” use of petroleum….sales of cars and gasoline limited to Party members or at the permission of a Party official. This not being a political site, I’ll say no more on this. Umm, I like the car. While there was nothing like the Thing in it’s time, it seems to me that the Thing is similar in both form and function to the 1948-50 Willy’s Jeepster. In 1970, there were 214 Citroen Meharis imported into the US, perhaps the Thing’s closest competitor. WOW!, this is MY Thing. I am from Philadelphia and was on a road trip to florida. Thanks for posting. I have had this Thing 28 years. A few moths ago, the Thing had a gas heater fire and was damaged. It should be back on the road by the end of june 2012. Thanks for posting. I have had this Thing 28 years. A few moths ago, the Thing had a gas heater fire and was damaged. It should be back on the road by the end of june 2012. This picture was on the trip from florida to philly with my sister. Very exciting to see this! Frank and I had a great time driving this Thing from FL to Phila! It made it over hill and dale for 1400 miles – what a road trip. Wow! I’ve wanted one of these Things since I was in grammer school and this article just got me perusing various classified ads. To those nay-sayers, this Thing with all its flaws is probably more fun for Frank & other owners than a new AMG Mercedes SL. Fun cars and their owners have a special bond that lets them overlook shortcomings because of the grins they wear everytime they drive their unique car. Of course, this is something modern day Ralph Nadars will never know. Were there any stories of people dying at an alarming rate in Things? No? Maybe they weren’t so unsafe after all. Hey, I survived a childhood where many a car ride was spent running my matchbox cars over the hatshelf of our ’69 Bonneville. Me and every other kid I know lived through childhood without ever being strapped into a carseat. Go figure. Hey, have some fun behind the wheel. Dig 5K out of the bank and buy a used Thing, Ghia, Opel GT or whatever. Life’s too short to drive a Honda! I owned one of these cars for many years and it was one of the most fun cars to own and drive. Nothing could kill it! I ran it for two hundred and fifty thousand miles, replacing only brakes a few times and replacing a clutch. I also had to replace the plastic side curtains once. 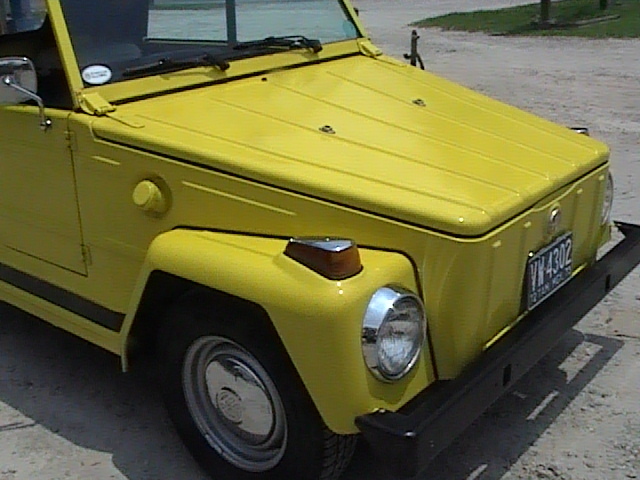 I did have a fiberglass top in addition to the soft top so that preserved the soft top. During the summer, The car took me to Vermont almost every winter weekend to ski, never getting stuck in the snow. The heater left a lot to be desired, but that was a Volkswagon thing. I sold the car separately from the fiberglass top, and after many, many years of service, after selling it, I lost only seven hundred dollars from the original purchase price. I regret selling it, wishing I had kept it to be restored since they are worth a great deal of money now. But life’s needs change and The Thing did not fit into our needs at the time. I truly miss it to this day! I have a 74 Thing I am working on for my daughter. Can anyone help me with finding a center console with the heating and defrost duct? Thank you. They did try selling a civilian version of the Kurierwagen here in Britain too, in 1975. Here they called it the ‘Trekker’ (RHD = Type 182 by the way) .. They sold only probably double figures, and it was dropped within months, so survivors are a rarity… Most 181s in Britain nowadays are ex-NATO Type 181s from Germany. I have to add some more first hand comments. In the mid-70s my wife had one and we drove the heck out of it; all over Nevada and then in Florida. I remember cruising down US 6/95 at midnight, top down, windscreen folded, lights out, watching the stars. In that 40 miles we didn’t see another car. It was okay off road but certainly not equal to 4wd. 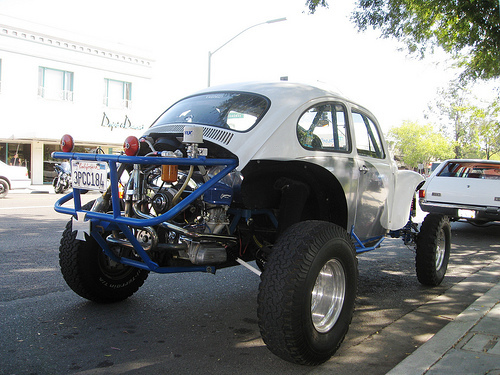 I think a Baja Buggy would be a better vehicle because the Things were heavier than Beetles. But let me tell you about the heater. It was a gasoline powered burner with one outlet placed just over the accelerator, guaranteeing a burned foot if one didn’t switch feet on the pedal. It was on a timer for some reason. If there was a thermostat or defroster they didn’t work. My wife drove to work in the winter wrapped in a blanket over her long coat. I had to laugh when a recent episode of “Wheeler Dealer” made a big deal out of semi-restoring a Thing and selling it to some sucker in Japan for an outrageous amount.